(a) Glycolysis, (b) the pentose phosphate pathway, (c) the transition step, and (d) the tricarboxylic acid cycle (TCA cycle) are used to gradually oxidize glucose completely to CO2.Together, these pathways produce ATP! reducing power, and intermediates that function as precursor metabolites (depicted as gray bars). 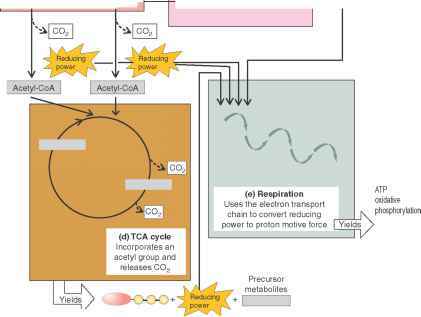 (e) Respiration uses the reducing power to generate ATP by oxidative phosphorylation, employing an inorganic molecule as a terminal electron acceptor. (f) Fermentation stops short of oxidizing glucose completely, and instead uses pyruvate or a derivative as an electron acceptor.